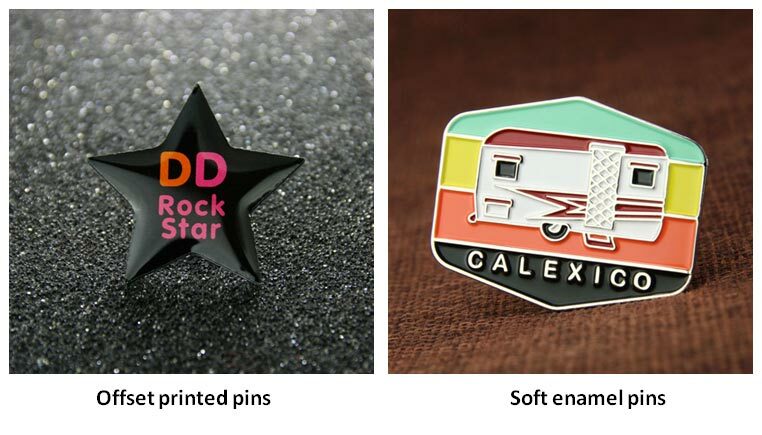 We are often asked to explain what is the different between offset printed pins and enamel pins. The answer is most of offset printed pins are created from a digital file or photographic negative. 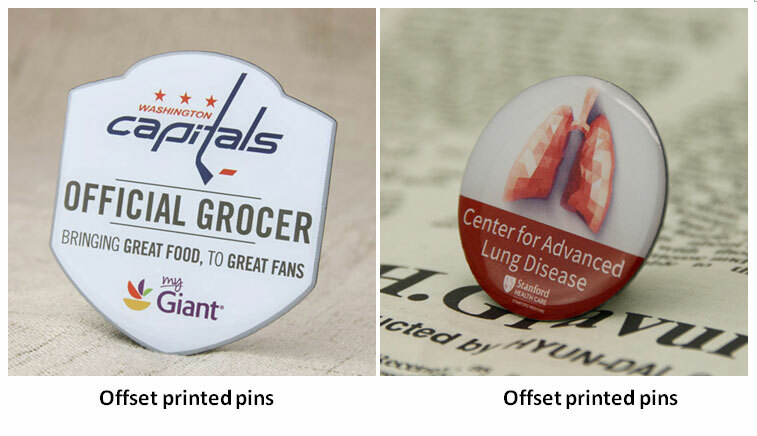 The advantage offset printed pins are thin, lightweight, inexpensive and fastest to make. The disadvantage is that the quality of the offset printed pins is not high. Enamel pins are by far the most versatile pins, the design with smooth, shiny enamel on the inside, and with two different enamel processes available. Offset Printed pins do not altering or distort your design, which incorporate gradients, drop shadows or other subtle color changes. You can also choose unlimited choices of fonts, colors, and other types of design elements. Our offset printed pins are made of stainless steel or brass metal blanks that can be cut to your custom shape. Then use our high quality full-color printing process to offset printed the design onto the blank surface. Then, In order to protect the image surface from being scratched, a clear epoxy resin dome is applied over the imprint. An additional benefit of epoxy domes is that they give your image a glossy effect while also having a protective coat. 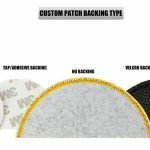 Finally, We provide fade resistance to the face of your custom lapel pins. We recommend providing high resolution artwork for this process to ensure that your pins are printed with sharp imagery. The better the source image, the better the final product. Offset printed pins are the most popular type and the best choice for trading. And they are inexpensive and look great and are widely used by teams. Enamel pins are more expensive than the offset printed pins but they are attractive. Because of its exquisite appearance and cumbersome manufacturing processes, it is called top quality handicrafts. Enamel pins come in two different styles: Soft enamel pins and hard enamel pins. Whether it’s soft enamel pins or hard enamel pins, All colors are manually filled into enamel pins, and each color can only be monochrome. The complex colors and gradients can’t be used for enamel pins. The soft enamel pins are a very popular process, and the prices is cheaper than hard enamel pins. The color of the soft enamel pins is a liquid pigment that evaporates after baking. The color area will be one layer lower than the metal area, so the soft enamel pins looks layered, because the light changes caused by the different heights make the badge look very conspicuous and beautiful. The hard enamel pins are high quality pins. The pigment of the enamel is a fine-grain solid pigment. Because of The color area is flat with the surface of the metal area, so that the surface is smooth to the touch and the colors are brilliant and shiny. If you want to make a high quality lapel pins with a collectible value, the hard enamel is a good choice. Enamel pins are ideal for everyday use. 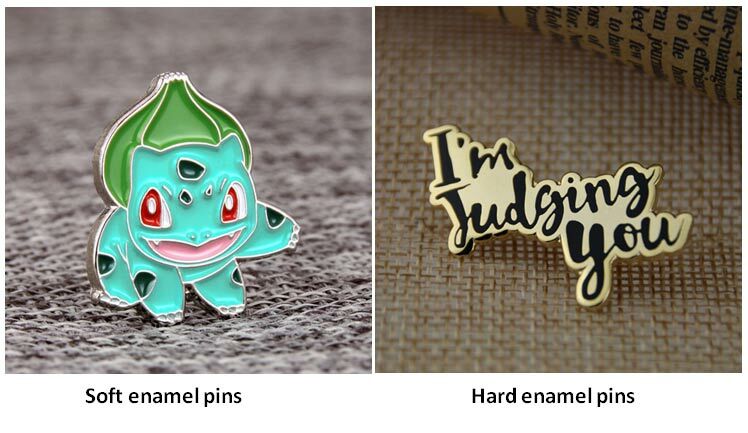 Because of the high perceived value, Enamel Pins are also perfect for perfect for: Consumer promotions, Team building, Conventions, Fund raising, Member gifts, Trade shows, Brand awareness, and reward. If you are looking for custom enamel pins, you should visit the website www.gs-jj.com or by emailing Info@GS-JJ.com. You can also call 1-888-864-4755 toll-free. You also can fill out our request for quote form: just answer a few simple questions. It’s easy to design your enamel pins. 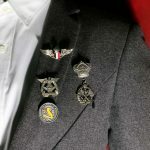 Thank you for writing very informative article for those who want to improve their learning about offset printed and enamel pins. Considering the fact that enamel pins not only look more attractive but at the same time they are more convenient to deploy. We are considering them for member gifts. I will definitely contact you very soon. Thank you Steven! we hope hear from you soon, We can create any design or develop any idea you have. We offer up to 40% discount (Promo), free design and free shipping!!! We don’t have minimum qty to place an order. Don’t miss the opportunity. Since enamel pins are filled manually with custom colors, they are perfect for consumer campaigns. Last year, my brand used soft enamel pins for promotion of a product and we received phenomenal results. I am desperately waiting for approval of custom designs from our marketing head and once she approves, I will give you guys a heads up call. Keep writing for your followers! Thank you Vera Graham, we hope hear from you soon Please try us and you will see how affordable is to get your pins made with gsjj.com, You can write to us to info@gs-jj.com. Waiting hear from you. We offer up to 40% discount (Promo) and free design, Don’t miss the opportunity. Exceptional stuff! You guys are fabulous. The offset printed pins crafted by your team are still with us and we often use them for marketing and brand awareness. This particular article has given me some very innovative ideas to use offset printed pins for our upcoming events. Hello Katherine, Thank you for your trust and look forward to our long-term cooperation. I stumbleupon everyday. It’s always useful to read through articles from other writers and use something from other websites.